From a spectator’s perspective (or as much of a spectator’s perspective as a seasoned reenactor can have from the sidelines), Klash on the Kankakee was a very successful reenactment. The encampment looked great. The schedule was packed with the little extras that make smaller reenactments interesting, such as the signing of the Declaration of Independence. But I’ll tell you what really made the difference to me…the redcoats showed up with enough field participants to rival the blue. At a smaller event like Klash, that’s really something! It’s not that the British forces don’t typically show up. We just currently have this green coat issue that, to any only-partially-historically-educated audience members, can be confusing. Why? Because generally people think about the red vs the blue in the Revolutionary War. So when they don’t see much red, and instead see a whole field of blue, green, a little grey, some baby blue, and a whole lot of soldiers without uniform coats on at all, well, I’m inclined to think they’ll be confused…and probably disappointed. Green coats did appear on both sides of the field historically. Tories, the colonists who decided to side with Britain, typically wore green. A good example is The Patriot (think the bad guy). Then there was green on the Continental side as well, such as the Continental Marines (that’s the unit I’m in). A lot of reenactors like to be a part of these unique units with interesting histories, so it’s happened before that we’ve had reenactments with blue and green coats on one side, fighting green coats and maybe one or two red-coated soldiers on the other. Our organization is taking “go green” a little too much to heart. I know, I know, I’m being a bit hypocritical because yes, I “went green” too, and I’m consistently trying to recruit and grow our unit. But I’m not saying we shouldn’t have green guys on the field. Green guys are historically very important. What I am saying is that its awesome when the red guys make it out, especially with good numbers. So here’s a shout out to the 55th Regiment of Foot, the 8th Regiment of Foot, the 84th Regiment of Foot, and the 2nd Battalion of Light Infantry. The British line looked British. You guys made a huge difference, and you looked great! Picture courtesy of Melanie Ruley. I didn’t have my camera with me at the Klash, so I didn’t get any pictures of the guys on the field. 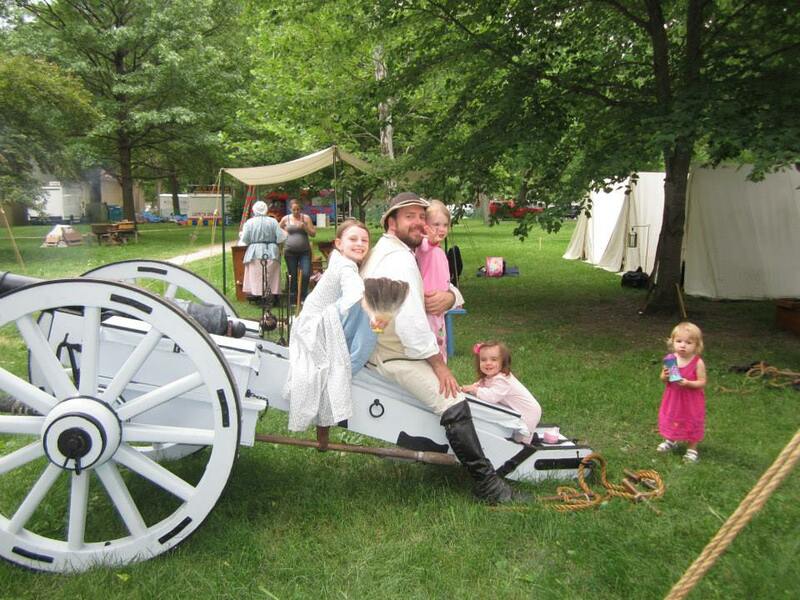 So here’s a romper rom photo of our little Marine girls and Ken Ruley after-hours on the canon carriage. Next Next post: So…I’m Getting into Archery, and You Can Too!